English Teacher On The Loose: LOOKING FOR LOVE? So you may be hoping that you'll be on the receiving end of a little love this coming Sunday. 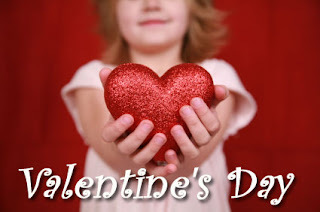 Valentine's Day is a day of joy for those who do get something and a day of sadness for those who don't, but were expecting it! Most of us recognise that in reality it's a Hallmark holiday (it is the second most popular for sending cards after Christmas) and it is true that most do not know the origins of the day. There are three saints in the Catholic church who go by the name Valentine. One was a priest during the reign of the Emperor Claudius II, who married young lovers in secret, although the the Emperor had ruled that soldiers should remain unmarried. He was decapitated for this. Another was supposed to have freed prisoners from Roman prisons and the last is claimed to have fallen in love with the prison guard's daughter. There are even suggestions that the origins lie with the pagan festival of Lupercalia, an ancient Roman fertility festival, which was held on the 15th of February and supposed to bring fertility and a good harvest to all those who were blessed during this celebration. Think of all the reasons why you love this person. Choose your favourites and write them down. Avoid 'very' and adverbs - use strong adjectives and verbs instead. Order your ideas in way that sounds great when you read it aloud - your poem doesn't have to rhyme. Write an acronym using you lover's name or the words LOVE or ROMANCE, or something just for you. The saying goes that 'To give, is to receive.' so why not show your love this year! Don't just think about romantic love. How about showing your friends or your family how much you appreciate them? Give a little love to an elderly relative or neighbour who may live alone.